This follows on from Slow Train on the Adriatic. I am on a journey back to our house after having dropped off the hire car. The man in the tobacco shop at Porto san Giorgio train station (for in Italy you buy your bus tickets in cough merchants’) said that he could only sell me a ticket as far as Servigliano, and he did not know how I would get a ticket for the final leg of my journey from Servigliano to Santa Vittoria, this despite it stating on the bus company’s website that you could book right through. Though in fact, as it turned out, he did the best thing, for a reason I was to discover later. The Amandola bus arrived, a coach-like bus with comfortable seats. I stuck my ticket into the strange backwards-facing validation machine at the top of the steps leading from the door of the bus to the seating area (disabled access? Oh, yes, so we are, we’re in Italy), the machine swallowed my ticket and then to my relief made scratchy printing noises and spat my ticket out again, stamped. Meno male. I decided to sit one row from the front, where I could watch the driver, but wouldn’t get projected through the windscreen if he ran into the back of a truck. The bus was fitted with seatbelts, but using them would have seemed nerdy to the point of rudeness. A few people get on the bus. Some ask if he is going to Fermo. Si. Along by the railway and then turn left – a tight turn into a road with a tree-lined walkway down the centre, the roadway a fair squeeze for the bus. Slowly along this road. We pick up a few more passengers and then cross the SS16 at the traffic lights and up the hill towards Fermo. Fire engines wailing their way down. Some people get off the bus, and some get on, though only dribs and drabs. The bus takes the climbing road with the tight right hairpin up to the entrance to the main square of Fermo, the Piazza del Popolo, where all but about three people get off. The driver gets off too and talks to a man who tells him about a Somali child, a black child, who it seems will need help somewhere during the day. I only understand about a third of this. The driver nods while tucking his blue-grey open neck shirt into his trousers. The man puts the driver’s collar straight for him, that had got turned inwards. The area outside the Piazza del Popolo in Fermo is where the buses pull up at the bus stop, then circle round and go back down the way they came up. Our bus seems to be going back to Porto san Giorgio, but I suppose the driver knows what he’s doing. Down a suburban road with speed humps, then turn left and, ah, that’s it, we’re pulling up at a school, a large modern orange-red building, there’s a serious number of secondary-age children anticipating the arrival of the bus. The young people bundle onto the bus, far more of them then there are seats for. Boys and girls. Jammed in, though had some of them moved down the bus a bit more it wouldn’t have quite so tightly packed at the front. The driver doesn’t say, ‘Move down inside the bus please’. He doesn’t say anything. There’s a seat vacant next to me. A girl of about 15 with acne – quite unusual for an Italian, though she looks more northern-European than Italian – says, ‘Posso?’ ‘May I?’ People do that in Italy on trains and buses. Very polite. The children, though chattery, and notwithstanding their unreadiness to move down the bus, are very well-behaved. A large girl in a white T-shirt and glasses, maybe 14-years-old, is almost sitting on the driver’s lap. He tells her with a smile that he can’t drive with her big fat bum pressed against the steering wheel. Not that I can hear what he actually says, all I see is his smiling face in the mirror. The girl tries her best not to get too pressed down on the driver, though there isn’t much other room for her to be. Perhaps she enjoys the thrill of sitting on the driver every day. The youths piled inside the bus are getting progressively hotter, pinker, and sweatier. They’ll do this every single-bingle school day. 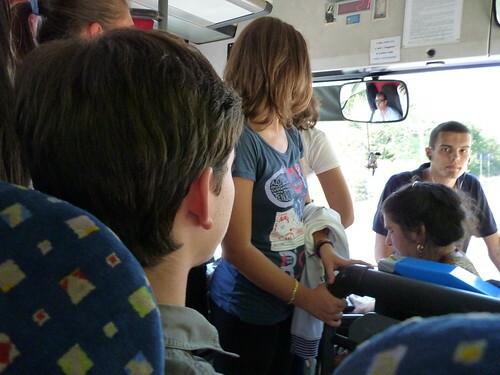 The bus leaves the school and then stops again on the hill leading into Fermo – the hill we came up less than half an hour earlier – where yet more young people cram themselves in somehow, together with the ticket inspector, who proceeds to squeeze his way down the bus, somehow. I give the inspector my ticket and he punches a hole in it, and then a hole in the magnetic strip so the ticket can’t be used again, not that it probably could anyway, and then slides it to me. Not gives it, slides it, under his hand, as if passing me a card on a card table. Acne seems not to have a ticket. She talks the man round. I think he is telling her to get it sorted pretty soon. Looks like she might know him. The bus pulls into a kind of bus park, where a pile of youths, including acne, get off and transfer to a bus showing destination, Monterubbiano, and an equivalent number, who had arrived on the Rubbiano bus, get on. A few more stops yet in Fermo, where even more people squeeze themselves into the bus, pressed right up to the steps at the front door. This seems to be normal. Everyone squeezes on somehow. A mass of young arms and bodies, filled to the doors..
As the bus makes its way down into the Tenna valley, past the road to Monte Urano to the Oasi shopping complex, sweating youths get off at bus stops along the way. Some of the bus stops are just alongside a wall on the main road. They don’t look like very safe places to get off a bus. The bus makes its way along the Tenna valley road, stopping to offload more youths every so often. At some of the bus stops there are cars, on the school run, waiting to pick up the youths to drive them the final leg home. The bus is clearly running a bit late, not helped at one point by its having to follow a tractor for quite a long stretch. We get to the point where there are just two cars between us and the tractor, and the traffic in the opposite direction clears enough for the first of the cars to get round comfortably. But he doesn’t go. Parp! Parp! The bus driver blows his horn. ‘Huh!’ he whacks his forearm down on the steering wheel. Eventually the two cars in front do get round the tractor, and then the bus does, the driver giving the tractor a two-tone on the horn as he passes. The farmer looks surprised, wondering what all the noise is about. It is now about a quarter to one. The bus will have picked up the young people from outside their school a good half hour ago. Presumably they finished school at twelve. There will be no afternoon session. Everything must come second to lunch, and then there’s no point in repeating the whole process again today. Perhaps not surprising that Italy does not come high in the international educational quality tables. The school day in Italy is generally said to be 8.30am to 1.30pm, and maybe it is, for there are later buses that do this route. Maybe it was just some of the pupils who get away early on certain days. Maybe. There were quite a few scuolabus (school buses) to be seen on our journey. The driver nodded or or flashed his lights. And there are such things as Italian school dinners, possibly just for much younger children, who may, I suppose, not be able to get themselves home on the bus. The Unesco Education Information Network in Europe document on Italy suggests that schools provide a certain number of teaching hours per year, rather than having standard-length days, so perhaps that’s the answer. As with so many things, I need to find out more about this and Google is poor on the sort of things that I wish to know. The story continues with Small Bus up the Hill.